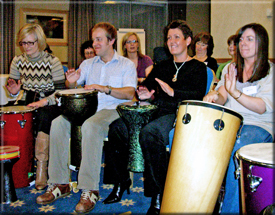 Enjoy taking the credit for a great corporate team building event in Leeds by letting Active Rhythmology drum up some "fun energy" in your team circle. We are based in Leeds so are ideally placed to help with a Business Conference Energiser, Corporate Team Building Activity or Staff Away Day Exercise anywhere in Leeds, Bradford or West Yorkshire. 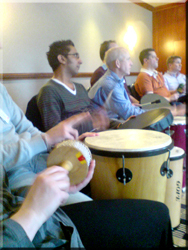 A Leeds team building activity where staff compete can be counter-productive but our corporate drumming activities encourage your team to co-operate when they watch, listen and respond while grasping the rhythm. Playing drums and percussion together is an exhilarating, bonding and vibrant experience that delegates will remember and Leeds is a great place to do it! Conference delegates becoming bored with presentations in Leeds suddenly find they are having high energy drumming fun a few minutes later. At the same time they learn to communicate better and build their confidence both individually and as a corporate team. On the surface delegates relax, reduce stress and have fun - while away at a deeper level sub-conscious changes take place as the team interact in new ways. Tip: turn your speakers on or wear headphones! So if you are planning a Leeds team building drumming event remember that we are the local drumming company ready to provide a Corporate Drumming Workshop, Team Building Drum Circle, Conference Energiser Boomwhackers or Eco Friendly Junk Percussion activity. Find out more by using the menu buttons - and if now you can spare a few minutes, please watch our videos to get an idea of how we work at team building events, conferences and staff away days. Then contact us to discuss your Leeds event and get our fee proposal. We like to provide team building rhythm activities in Leeds because it reduces our carbon footprint, travel costs and expenses - meaning savings for you - but we travel all over the UK to rhythmologise our clients when needed. Hire us for your corporate team building event in Leeds!